The garage can be the home's greatest storage space - as long as you realize its true potential. When homeowners think about renovating their house, most think first of updating their kitchen or guest bathrooms. Then they might consider their living areas, like bedrooms, dining rooms, or basements. But what about the garage? For many homeowners, the garage is simultaneously one of the most over- and under-utilized parts of their home. According to a 2015 study from Gladiator GarageWorks, about one in four American homeowners can’t house a car in their garage because so many unorganized elements are filling it up. Remodeling companies have tackled this issue by designing spaces that transform messy, dark garages into sleek storage spaces or extensions of the home. 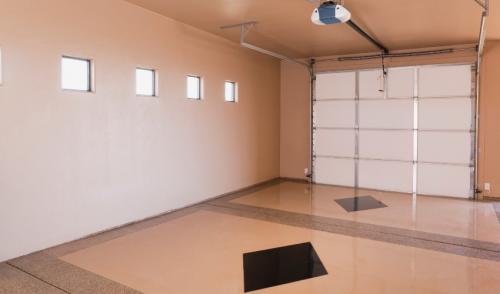 The first step to any garage remodel is finding out how the homeowners want to use the space. While the majority want to organize their clutter and get their cars back into their garage, others may be looking for a workshop, a summer porch, or a guest bedroom. The GarageWorks study found that 27% of homeowners use the garage for hobbies, 23% use it to work on cars, 19% use it for projects such as woodworking, and 13% use it as an area for exercise or sports. There are almost as many flooring options as there are garage purposes. Homeowners can keep or polish their existing concrete, install interlocking tiles or rubber roll outs, or add a long-lasting epoxy or polyaspartic floor. Fritz says interlocking floor tiles are a product of the past. In the late 1990s and early 2000s, they were the go-to option for many garage remodelers, but they were difficult to keep clean. The newly developed epoxy and polyaspartic floors with color are much easier to maintain and offer a look that sets them apart from the usual concrete. Adding storage on the walls and ceilings will help declutter a garage. Metal shelving can be installed on the ceiling to store plastic bins containing infrequently used items. Slat wall panels (a storage system with lined indents) will allow homeowners slide hooks and shelves in and out to hang large items like bikes. Wall-to-wall cabinetry will give clients the opportunity to store what they need and keep it out of sight. Built-in work stations allow owners to store hobby-related tools and equipment. Cabinets above the workspace will provide additional storage options and tall cabinets will allow homeowners to store longer items. Open cubbies can add variation and open wire shelves and baskets can make putting toys away easier for kids. For homes without a mudroom inside, the area before the door into the home can serve as a makeshift entrance with storage for shoes, bags, umbrellas, and other items that are used daily. On either side of the door into the home, tall locker cabinets, shoe racks, and a bench with storage underneath can be installed. Homeowners can choose to make the cabinetry cubby-like and design open units with hooks inside for coats, and shelves on top for shoes and baskets. Besides adding additional storage, some homeowners like to use the garage as a space to do what they love. Auto enthusiasts may design a space that allows them to store their tools and fuels so they can work on their cars in comfort. Gardening enthusiasts might design their garage to hold pots, soil, and tools. To add some pops of color into the remodeled space, consider painting the unused walls to match the client’s hobby. Bright reds, cool blues, and sleek grays are common options that add something extra to the space. Repainting the door that leads into the home is also a great opportunity to add some color. Homeowners also can choose to insulate the garage walls and transform the space into a home gym, man cave, or extended living room. Although this option is pricier and doesn’t typically fit cars, it can add square footage to the home’s existing footprint. California-based Kerrie Kelly Design Lab converted a detached garage into a fun lounge. With some white paint on the truss ceiling, insulation and shiplap on the walls, and polish on the concrete floors, the homeowners can use the space year round as an additional living room.